Make the filling: Sauté the garlic in a swirl of olive oil over medium-high heat until just sizzling. Add the mushrooms and cook until they are barely soft. Squeeze in half of the lemon and continue cooking until the mushrooms are tender. Remove from heat, add a healthy pinch of salt, and toss in most of the basil. 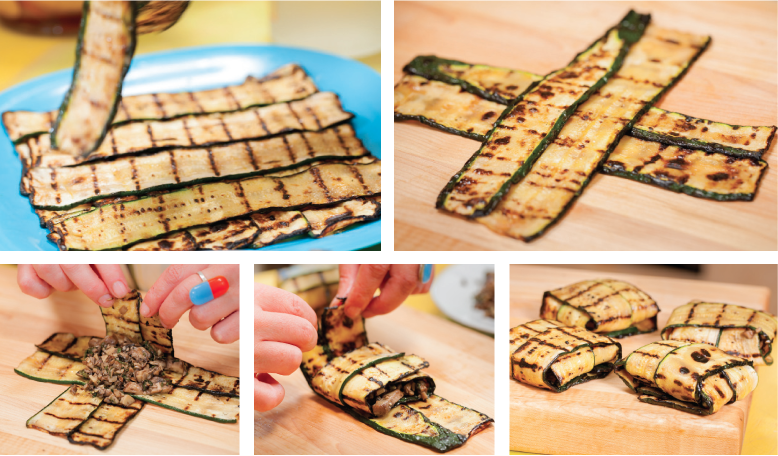 Grill the zucchini: Slice the zucchini lengthwise as thinly as possible—a sharp knife or mandolin are both great tools for this task. Brush the slices with oil and cook on a hot grill (or grill pan) until charred and soft, a few minutes on each side. Cool. Assemble the parcels: Lay two pieces of zucchini side by side, overlapping slightly lengthwise. Repeat with another two pieces and lay them atop your original slices so they make an x. Place a spoonful of filling in the center. Fold the parcel together by wrapping the bottom most zucchini slices up and over the filling, then fold in the upper slices. Place on a serving plate, seal side down, and repeat with remaining zucchini and filling. Garnish the parcels: Sprinkle liberally with toasted pine nuts, lemon curls, the remaining basil, a few splashes of olive oil, and a dash of Maldon salt. Even an Argentine would be impressed! Covered, these keep beautifully at room temperature up to several hours, or in the fridge for several days.